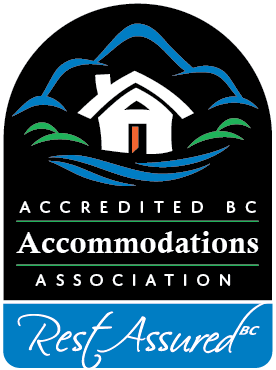 Accredited BC Accommodations is foremost a professional association of innkeepers of quality B&B/Inn lodging in the province of British Columbia, formed for mutual support, education, industry representation and marketing. In return for the right to be a member of Accredited BC Accommodations, the member agrees to display the Accredited BC Accommodations logo on their B&B/Inn business website home or main page, contact page, or links page, with a hyperlink to the Accredited BC Accommodations website home page. Failure to do so will result in the establishment losing the privileges of membership and forfeiting any and all fees paid to the Association. Our membership year runs from November 1 to October 31, but you can join Accredited BC Accommodations at any time. *** First time members can join at this special rate! Be part of this supportive group of B&B innkeepers. Members refer to members, and the association works on behalf of all to promote and protect the true Bed & Breakfast Experience! attend the annual general meeting and conferences at member rates – this includes full membership voting rights. Accredited BC Accommodations also offers Individual and Corporate Associate Memberships. Associate Members are non-voting members. Associate Membership benefits individuals or businesses working in the Bed & Breakfast , self-catering, and related Tourism industries. Reciprocal linking is strongly encouraged.